SUNDAY SEPT. 16 The Cross Country team opened their 2018 season competing as individuals in the Queensborough Invitational. The meet held at Van Cortlandt Park in the Bronx. The Viking’s med were lead by Tristan Fordyce (Mt Vernon HS) who finished 94th. Fordyce’s time, on the 8 K course, was 38:12.0. Haley Duggan (Pleasantville High School) led the women. Duggan finished 119th on the 5 K course with a time of 31:45.7. SATURDAY SEPT. 22 The Viking men finished 14th at the Fred Pavlich Invitational hosted by Bard College. 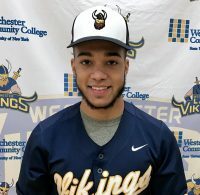 Randy Culcay (Ossining High School) led the Vikings. Culcay finished 64th with a time of 32:58.8 on the 8 K course. The Viking women were led by Haley Duggan who finished 118th with a time of 37:459.5 on the 5 K course. TUESDAY SEPT. 18 (Valhalla, NY) – Franco Ladron De Guevarra (White Plains, NY/White Plains HS) scored two goals, and Wali Azizi (Buchanan, NY/Hendrick Hudson HS) had a career-high four points as the Westchester Community College Men’s Soccer team improved to 5-1 with an 8-1 win over Kingsborough Community College on Tuesday at Barrett Field. With the win, the Vikings improve to 3-1 in Region XV play. Despite playing at the tail end of a day’s worth of torrential downpours that rendered the playing surface swamp-like, Westchester Community College found a way to play fast, and score often as the Vikings found the back of the net four times during each half. Luis Galeano (Mamaroneck, NY/Rye Neck HS) opened the scoring at 1:20, scoring his fifth consecutive goal for the Vikings off of assists from Azizi and Jose Tovar (Yonkers, NY/Riverside HS) to make it 1-0. 11 minutes later, Ladron De Guevarra scored for the first time, a transition goal off of a beautiful assist from Azizi to make it 2-0. Seven minutes after that, William Morais (White Plains, NY/White Plains HS) scored his first career goal, a corner kick tally off a feed from Tovar to make it 3-0. After that, play was relegated to the midfield for quite some time, until at 30:24, Mathew Rios (Yorktown, NY/Yorktown HS) fired a shot on net that was deflected into the goal by a Kingsborough defender to make it 4-0. The Wave scored their only goal of the game at 34:51 to make it 4-1 at halftime. The second half featured much of the same as Westchester controlled possession for almost the entirety of the final 45 minutes. Ladron De Guevarra scored his second of the game at 51:10 off of an Anthony Aguirre (Sleepy Hollow, NY/Sleepy Hollow HS) assist to make it 5-1. At 68:11, Azizi scored his second goal of the season to increase the lead to 6-1, on a goal assisted by Bryan Terrones (New Rochelle, NY/New Rochelle HS). Scoring was rounded out by Shane Smith (Mount Vernon, NY/Altoona HS) at 71:18 and Lucas Rodrigues (White Plains, NY/White Plains HS) at 76:11. The high-scoring affair made for an easy day for Vikings goalies Guilherme Griza (Novo Hamburgo-RS (Brazil)/Colegio Marista Pio XII) and Jair Mejia (Yonkers, NY/Riverside HS). Griza stopped all three shots he faced during the first 29:25, while Mejia saved two of the three shots he faced in relief. Overall, Westchester out-shot Kingsborough 36-15, and took 10 corner kicks to the Wave’s four. WEDNESDAY SEPT, 20 Despite losing for the first time this season on Tuesday, September 11, the Westchester Community College Men’s Soccer team remains ranked in the top-10 in the nation. The Vikings came in at #8 in the latest NJCAA Division III poll, marking two consecutive weeks that WCC is one of the nation’s top teams. Individually, WCC boasts two players who are among the nation’s statistical leaders. Freshman goalkeeper Guilherme Griza (Novo Hamburgo-RS (Brazil)/Colegio Marista Pio XII) is seventh in the country in save percentage (.917) and ninth in the country in goals against average (0.56). Freshman midfielder Luis Galeano (Mamaroneck, NY/Rye Neck HS) tied for 11th in the nation with seven goals, is 19th in the nation with 15 total points, and is currently second in the nation with three game-winning goals. Homecoming saw Nassau CC stave off a heroic second-half comeback bid from the Vikings and held on for a 5-3 win. Due to wet field conditions, the game was played on the turf at Valhalla High School. Three Vikings found the back of the net during a wild second half. Freshman goalkeeper Guilherme Griza (Novo Hamburgo-RS (Brazil)/Colegio Marista Pio XII) made eight saves, but the effort was not quite enough as Westchester fell to 5-2 overall, and 3-2 in Region XV play with the loss during a game played on the turf at nearby Valhalla High School. The early going did not seem to call for a dramatic final 45 minutes as the region-leading Lions (6-1, 3-0 Region XV) seemed to put the game away during a 14-minute stretch of the first half when Nassau scored at 25:49, 35:04, and 39:43 to take a 3-0 lead that remained that way into halftime. During the first 45 minutes, Nassau out-shot the Vikings 14-5, and controlled possession for much of the first half. From the opening whistle of the second half, things seemed to change. Two early chances for the Vikings were thwarted by Nassau, but Franco Ladron De Guevarra (White Plains, NY/White Plains HS) put Westchester on the board at 50:44, blasting home a terrific pass from Miguel Perez (Montrose, NY/Hendrick Hudson HS) to make it 3-1. For Ladron De Guevarra, it was his fifth goal of the season. The Vikings found the net again, as 10 seconds after Ladron De Guevarra’s heroics, Giovanni Gibaja (White Plains, NY/Johannes Gutenberg) took possession of the ball, made a move just outside the box, and fired a low rocket past the Nassau goalie for his first goal of the season, and the game was suddenly 3-2. From there, Westchester tried valiantly to tie the game with Ladron De Guevarra missing an opportunity to draw the game even by inches, and Wali Azizi (Buchanan, NY/Hendrick Hudson HS) coming close twice in a row. As Westchester desperately tried to tie the score, and took a few risks to get there, Nassau pounced on the counter-attack, scoring a breakaway goal at 61:37 to make it 4-2, and give the Lions what seemed like some breathing room. However, Westchester was not finished. Less than a minute after Nassau’s fourth goal, William Morais (White Plains, NY/White Plains HS) found Luis Galeano (Mamaroneck, NY/Rye Neck HS) with a gorgeous pass, and Galeano scored his eighth goal of the season to make it 4-3. Once again, Westchester went on the offensive to try to tie, and one more time, Nassau used the Vikings’ desperation against them. At 67:10, Nassau scored on another breakaway goal for the final tally of the day, and the 5-3 final. Out-shot 14-5 during the first half, Westchester out-shot Nassau 17-8 over the final 45 minutes, giving each team 22 shots for the game. Additionally, WCC had 14 corner kicks, while Nassau had eight. The five goals against marked the first time this season that a team scored more than one goal during a game against Westchester CC. TUESDAY SEPT. 18 (Bronx, NY) – Sophomore Lindsay Leggio (Mahopac, NY/Mahopac HS) had a match-high 20 assists, to go with eight digs, three kills, and three service aces. Madison Young (Greenburgh, NY/Woodlands HS) registered 13 kills and six digs as the Westchester Community College Women’s Volleyball team continued its incredible start to the 2018 season with a 3-1 win over Monroe College (Bronx) on Tuesday night at Roberto Clemente State Park. THURSDAY SEPT 20 (Valhalla, NY) – Sophomore Madison Young (Greenburgh, NY/Woodlands HS) had 12 kills and two solo blocks. Lindsay Leggio(Mahopac, NY/Mahopac HS) added 21 assists, eight service aces, and five digs as the Westchester Community College Women’s Volleyball team won its fourth consecutive match, 3-0 over Sullivan Community College on Thursday night at Viking Gymnasium. With the win, Westchester is now 4-1 overall, 4-1 against Region XV competition, and 3-1 in Mid-Hudson Conference play. The Vikings swept the match 25-14, 25-17, and 25-8 for their first sweep of the 2018 season. SATURDAY SEPT 22 AND SUNDAY SEPT 23 (Suffern, NY) – The bad news: After winning seven matches during the 2017 season, the Westchester Community College Volleyball team has only seven wins in 2018. The good news: The 2018 season still has 11 matches on the regular season schedule. The better news: The way Westchester CC is playing, there could be many more matches to play after that. Sophomores Madison Young (Greenburgh, NY/Woodlands HS) and Lindsay Leggio (Mahopac, NY/Mahopac HS) had fine outings once again as Westchester CC swept both Hostos Community College and Bronx Community College during a double-dual on Sunday at Rockland Community College in Suffern, NY. With the wins, Westchester is now 7-2 overall, all of which have come against Region XV competition. The Vikings finished the 2017 season with a 7-13 overall record. WCC dominated Hostos to open play, winning 25-10, 25-19, and 25-12. Young had five kills and Leggio added 19 assists. It was a balanced offensive effort for the Vikings as sophomore Taylor Mello (Cortlandt Manor, NY/Putnam Valley HS) chipped in five kills and two service aces, while fellow sophomore Alysha Owens (Mount Vernon, NY/Mount Vernon HS) added three kills, two service aces, and two blocks. Also for WCC, freshman Melody Pabon (Bronx, NY/Celia Cruz) had one of her best matches of the season with six kills, two service aces, and two blocks. The Vikings continued much of the same against Bronx CC, winning 25-14, 25-18 and 25-6 to mark the third time this season that Westchester has defeated a team that beat the Vikings in 2017, after Bronx downed WCC 3-2 on Oct. 8. This time around, Westchester used a balanced attack once again as Leggio amassed a match-high 25 assists to go with five kills, four digs, and five service aces. Young added nine kills and four digs, while Mello chipped in five kills and 12 digs, and Owens had six kills and eight digs.